Nothing appeared to be accomplished in an outward show. I spent years looking for investors and came up empty time after time. My invention literally sat on a shelf for a decade in my garage. My husband & I made a decision to start our own electrical contracting business and opened Accurate Electric fulltime and my husband left Ericsson Telecommunications. Now with 3 small children and a new business needless to say the Earring Angel got pushed way back, again, we had to take care of the matters at hand. My daughters began to believe in the possibilities as they got older when they understood what it was and how it worked, maybe because they used them too and gave them to their friends as gifts. I always thought SOMEDAY, SOMEHOW. I went to work full time nights and weekends as well as week days at Nordstrom in Frisco and became their best sales and customer service person for my department within the region in the first 6 months I was employed. I received the Pacer Award. Over the next 3 years I was a Pacesetter and trained staff. I was the go-to person for customers that needed help especially if they were upset. My numerous customer service letters were passed along and admonished by Pete Nordstrom nationwide. In 2003, I was recruited to become a department manager and went through the training program; however I was also running my husband’s struggling Electrical Contracting Business being hit by the beginning of the recession. I had to resign from Nordstrom to have the time to help save Accurate Electric and my children needed me. I was working 7 days a week for 3 years out of the home and in the home. Accurate Electric was doing well but began struggling after 9/11/2001. In June 2003 we downsized to a nice home in Frisco, Texas. Over the years I attempted to get my invention moving again, but what could I do without any capital to invest? Then one day a friend of mine caught me and questioned but really kindly scolded me and said “When are you going to do something with your Earring Board?” I gave her my reasons, mainly money and the fact that no one was supporting the idea; I was always told it was a pie in the sky. She shook her head and said “If it is God’s will, you should just do it” Then she asked to buy one of the last dozen I had left. Thank you Jackie! She gave me the push I needed. I called California, and asked Chris at C& B Mold if he remembered me. We had never met and had only 3 phone conversations 10 years prior. He said he remembered me, “THE EARRING BOARD LADY”. I asked if they still had the mold. He said “Probably not, we moved to Monrovia a few years ago, and scraped a lot of old molds”. I could not believe that my mold was scrapped and I asked him to check for me. It took him 3 days of checking and then he called and apologized and said it was not there, that they must have scrapped it. Disappointed, I thanked him for checking and wished him well. As I was going to sleep that night I prayed and asked “Did they scrap my so mold?” I heard “No” in my heart, so I asked The Lord “Well then…. You know where it is, have your angels wake him up and not let him sleep and tell him where it is, Amen” and I went to sleep. This is a fact the very next morning Chris called me and said “You are not going to believe this. I could not sleep last night and then I remembered this storage building that was pad locked out back of our old shop in Azusa. So this morning I went there and used bolt cutters to open it and guess what I found? Your mold!” I was so excited! I told him I would get back with him in a few days. I thought now what? A day or so later I was driving home when suddenly I noticed a sign that said Sunbelt Plastics right here in Frisco and it was walking distance to my home. I went inside and told them about the Earring Board. They said that they could make them for me using the mold from California. I called Chris and sent him all the documentation he needed. He wanted to be the manufacturer but agreed to send the mold to Texas for me. He said the cost to send it was about $225.00 for freight. I did not have the money or any way of getting it. We were barely getting by. Again through divine inspiration I asked Sunbelt if they had a Yellow Freight account and if they got discounts? They said yes and agreed to pay the freight and attach to my first order. Yellow Freight picked up and delivered to Sunbelt for half the cost and they allowed me to pay net 30 with no money upfront for the first order of 1000 pieces and the freight. I received my first stock and shipped my first EBay sale on 02/08/05. Needless to say, I sold enough that first month to pay them in full with no problem and I have been making and selling them ever since. I had originally named this item The Earring Board back in 1991, but when I went to purchase earringboard.com but it is was taken, so I had to find a new name. I kept thinking “safe haven” for your earrings which lead me to Earring Angel because it works as a guardian over your collection of earrings keeping them up and out of harm’s way seen at a glance and tangle free. I purchased the domain name http://www.earringangel.com which became http://www.angelynns.com. I wanted to increase sales so I ventured into other products that I could buy at discount stores and resell them. I didn’t buy an item to re-sell thinking of MONEY first. I bought an item asking the questions, Would I buy it? What would I pay? I researched on EBay items of interest to me to see what they sold for and kept notes so that when I went shopping I would have a guide. I bought only items that I myself would like to have, so selling something I loved would come naturally. I purchased everything on a credit card and only bought items that could be returned if for some reason I could not sell them within 30 days. Then my only loss would be my time and the listing fees that EBay charged, unless it was an auction item that I took the chance of listing low to bring in interest and found and there was little to no interest, this only happened once or twice no big deal. I did my homework and it paid off. Plus, another great benefit to selling other items is it brings traffic into your EBay Store and they end up buying something else too. I sold handbags, storage boxes, cosmetic organizers and other jewelry racks. I took risks but did my research first. I listed items for auction on EBay at .99 cents to bring traffic and it worked and I had great success. I happened to be visiting someone in the hospital I was told by 3 different people “You are such an Angel, Lynn” I did not think much about it. Then when I got home, days later, I was thinking of a business name…Earring Angel … Angel…Lynn… Organizers… Jewelry… Enterprises. Angelynn’s was born as Angelynn Enterprises aka Angelynn’s Jewelry Organizers a better self-explanatory name updated in 2009. Also, while I was visiting I saw these unique small antique Earring Trees in the hospital lobby gift shop/jewelry store in Beverly Hills. I spoke with a very nice man who sold vintage earrings, jewelry and watches etc. but he also sold vintage earring trees. They were so beautiful and unique, but very expensive. I asked him how often he sold them or were they primarily for displaying earrings? He said he sold them for over $100.00 no problem, so I told him I had a store in another state would like to sell them too. When I got back to Texas he said he would let me know. He gave me the importers name La Vie Parisienne so I got a catalog and started buying and selling them, which tested the demand for upscale high end jewelry organizing products. March 1, 2007 I applied and was accepted to interview for the Oprah Winfrey Show called The Next Big Thing, winners would be given the opportunity to sell on QVC. It was focus time. I asked myself “What is my best seller?” Answer: The Earring Angel. Of all that I am selling what do the customers love the most based on feedback? Answer: The Earring Angel. Are those sales growing? Answer: Yes! Then it occurred to me offer other colors of the Earring Angel! At first I could not afford to have them made in other colors so I faux finished them by hand to test customer interest. The faux finishes with the sponging techniques etc. was just way too much. I enamel painted in Black, Bronze, Dark Bronze and Copper. This allowed me to test metallic finishes before I went to the expense of prototyping a steel earring holder. I spent so much time sweating in my garage sanding, priming, painting and top coating Earring Angels it was unreasonable but worth it. 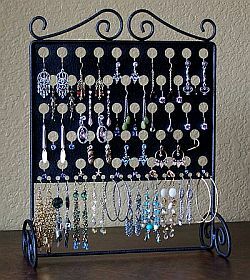 They were beautiful and the customers loved them so I started considering steel earring holders. During this time I scaled back selling all the other items i.e. handbags and alike, not because they were not selling, but because there is only 24 hours in a day. I went to Chicago for my interview with Oprah Winfrey’s The Next Big. Winners would be given the opportunity to sell on QVC. During my brief pre-screening they did not know what category to put me in. I suggested home organizational product category but they said they did not have one so they put me in miscellaneous which I believe hurt my chances. As I watched all of us in miscellaneous category isles not get the attention that other categories were getting I thought that they may have been looking for something really specific like kitchen gadgets. I was not selected, however I learned a lot. When the show aired several months later I saw the winners had invented kitchen gadgets, kid’s toys and home decorations and food. November 20,2007, I filed for a Trademark “Earring Angel” that was published May 20, 2008. I decided to staying within my category, jewelry organization and do more product research. 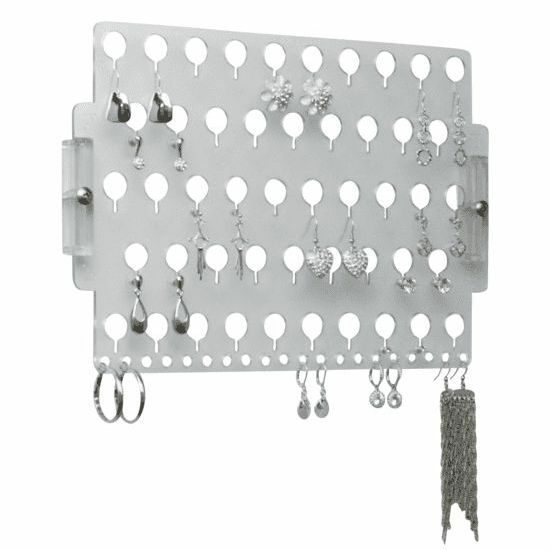 I purchased some ugly cheap looking necklace trees, bracelet racks and jewelry organizers to see what they would sell for. I purchased these for $4.50 to $16.99 and to my surprise they sold for $45.00 to $60 my EBay Auctions. I thought what would happen if I stripped them down and refinished them? So I did just that, and they sold for even more! 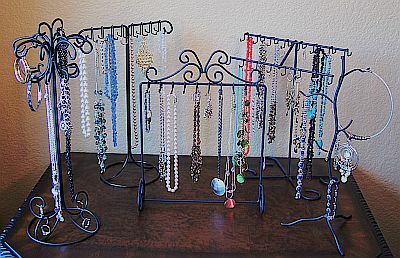 These necklace holders were light weight, flimsy, too short for most necklaces and not designed very well. I then was inspired to design my own. I would make them more durable, prettier, more elegant, timeless and not so trendy”. This is what I did! After I designed one I hired a manufacturer to make me 75 of them. They did an okay job, but I had to fix most of them they were not plumb. After I fixed them and put them up for sale they did very well. I started drawing and redrawing 2 more necklace trees which lead to even more. Then due to customer emails and my own ideas I designed my first table top steel Earring Angel and started selling them. What is that saying? Necessity is the Mother of Invention? Well then… Function is the Father. This entry was posted in Angelynn's Jewelry Organizers, The Story of Angelynn's and tagged Angelynn's Jewelry Organizers, Christian Inventors, Christian Small Business, Christian Testimony, Eco-Friendly Products, Growing Home Based Business, Made in the USA, MAGA, Make America Great Again, Professional Organizers, Selling Online, Trusting God for your business, Women Entrepreneurs, Women in Business News, Women Owned Businesses. Bookmark the permalink.